Valero staff members and children’s charity representatives. Checks totaling $30,000 were presented to seven area children’s charities at the Albion Valero Renewables plant last Thursday, Sept. 29. The funds came from the Valero Energy Foundation, the philanthropic arm of Valero Energy Corporation, and were raised by the 2016 Valero Texas Open and Benefit for Children. Valero – Albion is one of 11 ethanol plants operated by the Valero subsidiary, Valero Renewable Fuels Company, LLC, also known as Valero Renewables. Receiving the checks were Fullerton TeamMates, Boone Central TeamMates, Stephanie’s Maricles in Loving Equine (S.M.I.L.E. 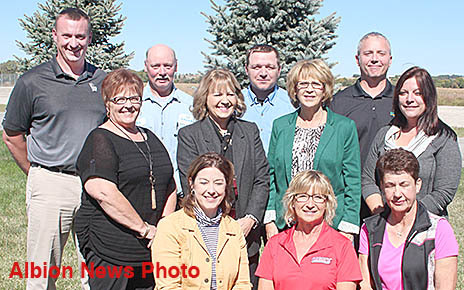 ), Cedar Cares for Kids, the Boone County Health Center “Reach Out and Read” program, Fullerton Head Start program and the Nebraska Children’s Home Society. Details in the Oct. 5 Albion News, print and e-editions.